My aim is to solve your legal problems. That is why I named my practice DeMatteo Legal Solutions. I don’t delegate your case to less experienced associates. I visit my clients who are in custody and try to get them out. 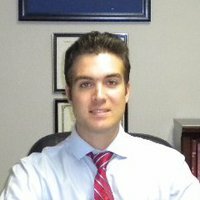 All legal work is done by attorneys and I personally handle all trials and other critical case events. A strong attorney-client relationship is important to achieving our goals. It’s your case and my service. I care about your case and I value your input. That is why I listen to you and consider your positions in making strategic decisions. I know that each client is an individual, so I consider not only the relevant legal authority but also the particular facts of your case. I can foresee different situations because unlike less accessible attorneys, I know your case inside and out. I believe my clients should know the facts of their case and I'll listen to you rather than shoehorn your case into a category. Keeping you informed as your case progresses, and letting you know of changes in the law that can affect your case. I'll help you plan for different outcomes and you should feel comfortable calling me with any questions or concerns. Even when I am in court, I respond to all calls, voicemails, text messages, and emails as soon as I can. I appreciate that legal problems and the decision to hire an attorney, including the costs, can be overwhelming. I set a priority to do my best and put you at ease. Call me today so we can discuss the reality of your case and see what we can do to handle your case in the best possible way. I also know that legal problems, especially criminal charges, often happen with little notice. You might not understand the cost, sentences, and circumstances of a case. If you meet with me early, we can discuss what's going on and what we can do, including how much it could cost. I understand that most people don’t set aside money for handling a criminal matter. When we discuss your case, we will also discuss payment arrangements that best fit your case. For example, criminal and juvenile matters, appeals, and post-conviction cases are handled on flat fee arrangements: you pay one fee for all included stages of the representation regardless of the amount of time required. The most common fee for criminal and juvenile cases is an initial flat fee for pretrial representation with a trial fee to be paid if the case is scheduled for trial. In other cases, such as car accidents and negligent personal injury cases, I will represent you on a contingency fee basis, and if there is no recovery, then there is no fee charged to you. In cases of intentional torts, such as fraud and assault, and civil rights, and in collection and other civil cases, payment is on either a structured flat fee arrangement or on contingency basis with a required retainer for costs and expenses (such as filing fees, expert fees, and fees for service of process). While fees are calculated on a case-by-case basis, you can check out our fee ranges. I don’t want the fear of expensive fees to prevent you from getting the representation you need. I provide free evaluations for all prospective clients and cases, and if needed, I will work with you to develop an individual payment plan.